YF-G1 DN25 1 inch Water flow sensor used for flow measurement it consists of a plastic valve body, a water rotor, and a hall-effect sensor. When water flows through the rotor, rotor rolls. Its speed changes with different rate of flow. The hall-effect sensor outputs the corresponding pulse signal. 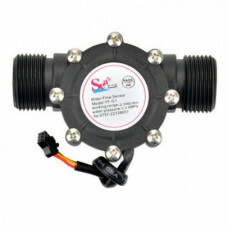 This one is suitable to detect flow in water dispenser or coffee machine.